Backups are a necessary routine for computers. Over the years, there has been many trends in computing that promised to make backups easier, simpler, but as humans, we still tend not to do a good job when it comes to backing up our data. The best solution for home users is Time Machine in Mac OS X. Simply add a drive (usually an external drive), and setup Time Machine to backup your entire main drive. Time Machine is the most simple backup to setup, but it is not perfect. After multiple backups, Time Machine usually encounters problems and the easiest solution ends up having to wipe your Time Machine drive and start all over again. On Windows, there are third party apps that allow for Time Machine like backups. Their main benefit is that their user interfaces are easier to use than the built-in Microsoft Backup program. There are also cloud backups as well now, so you can use iCloud, Google, Microsoft, or Dropbox for your backups. For most of us though, the cloud backup should really be a secondary backup and not your primary. In general terms the advice is to have a backup plan and to automate it as much as possible. Eventually all hard drives and flash memory fail in some way, and so backups are always going to be needed. As a project manager, one backup strategy that I have used for a number of years is to have a one folder backup strategy. For my business laptop, I create one folder under C:\Users\Username\My Documents\. This folder I name Projects and I then create a shortcut for it and place the shortcut on my Desktop. For every project I work on I create a folder underneath the Projects folder. As I complete projects, I then move these folders to \Projects\Archive. Anything related to a project has to be save somewhere under the Projects folder. This takes discipline, but is very easy to do once you keep to this routine of saving files to one folder. Although every Operating System now provides a directory structure for users, most people have made the Downloads folder their main working folder! How many times has someone asked you to help them find a file, and you have opened their Downloads folder to discover thousands of files? This happens way to often. The Downloads folder was never meant to be a work folder. It was mean to help users find their downloaded files, but over time, people have treated the Downloads folder as their main repository for everything. It is important to remember that the Downloads folder is really a temporary folder for files. Nothing important should ever exist in the Downloads folder. Anything in the Downloads folder can and should be deleted. Move all your important files and working files to your main Projects folder and never work on any files outside of the Projects folder. Now that you have all your files in one location, you need to copy your Projects folder and anything underneath to a secondary drive, backup location, cloud service. Although at the end of the day, you could simply copy and paste, drag and drop, it is best to automate this. In a business environment, there usually is a network drive or NAS that you can backup important files to. There are multiple apps or commands that you can script to accomplish this. The easiest way I have found is to use SyncBackSE. Using this application, I automate the backup of the Projects folder to run Monday through Friday, while I am at lunch. This backup strategy works well and is uncomplicated to use. A most perplexing problem occurred with my Windows Server computer. This computer was built about 2 years ago and is my primary server for the home network. It has a SuperMicro Workstation Class motherboard with ECC RAM. I built this box, after getting annoyed with inexpensive Dell Tower Servers. The Dell Servers performed well and are a good deal for most people, but my server is in my home office and I prefer a quieter box. The Dell Servers have noisy fans and even trying a few different replacement aftermarket fans, they still produced enough noise for me to invest in a custom system. I also found myself replacing the Dell Servers more often than I cared to. They were cheap enough, that I would end up upgrading the entire box every two years. The server I ended up building was very quiet and ran 24/7. It was connected to an APC UPS and so it ran almost without interruption. At least it did this until rather recently. After running for two years, the box was completely silent one day. Pressing the power button on the case would do nothing. There were no lights or any other signs of life (in this case electricity). I unplugged the computer from the UPS and into the wall outlet directly. 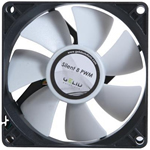 Pressing the power button on the case would make the case fan and cpu cooler fan spin for about a second or two. The motherboard would never light up. It would only do this once. I had to unplug the power cord and try it again to get the fans to spin. I then unplugged the power supply connectors from the mother board and then tried the paper clip test with the power supply and it would power the fans again for a couple of seconds. Alas, I could not resurrect the computer. My next step was to order a new power supply from Newegg.com and hope that it was my fancy power supply and not my fancy workstation motherboard that died. The new 1050W power supply was an upgrade from the 850W it was replacing. Other than the wattage difference, the new power supply had a switch to cycle on and off the power supply fan as needed. Once I swapped out the power supply, the box came back to life. The good thing about buying good components is that they are warrantied. I submitted an RMA request through the manufacturer website and a few days later, it was approved. After a week or so, they sent me back another power supply. I expected them to send me back a repaired unit, but instead they sent me back a brand new sealed box! Before I sent my power supply, I inspected it without opening it. The only thing I detected was that on the top of the unit, there was a sharp indentation, where it seemed as something pushed up against metal from inside. I am pretty sure that was not there when I installed it originally. Other than that the unit looked normal. The Windows Server has been running now normally for weeks. In this post, I discuss how to setup your own domain with Zoho Mail, a hosted email solution from Zoho. Similar to Google Apps, Zoho provides a set of online business tools including office apps, project management, and contact management. At the time of this post the hosted email package has a free option as well as higher tiers for users who need more options. The biggest selling point for Zoho is that none of their apps have advertisements, and so if you are bothered by other webmail solutions that feature ads, Zoho seems to be a good alternative solution. Other than webmail access, the other reasons to use Zoho is that it works with desktop email clients, smartphones, and tablets. In order of importance, here is what I was looking for in an email solution. I wanted an email solution that would work with my current personal domain that my family uses. Everyone in the family has an iPhone, iPod, or iPad that they can use for email. Oh, we do use our Mac computers every now and then, so we need desktop mail. I want to keep email on the server, and not worry about losing it. I can also manage my email from my smartphone when I have time. This is really convenient. Free if possible, but am willing to pay for a good solution on a yearly basis. Not having my kids bombarded with advertisements is a good thing. Please verify your domain ownership. This is required to prevent imposters from using domains to send malicious messages. You can follow either the CNAME method or HTML method for verification. As the administrator of your organization, you have a Control Panel link in your user interface. In the Control panel, click User Details on the left list of options and click Add User option on the top. You can also import a list of users by selecting the Import User option. We recommend you to test migration for 2 users before pointing MX records. 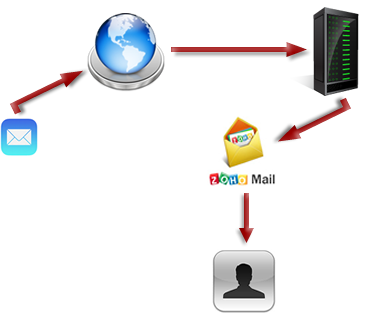 Point the Mail Exchanger (MX) records to Zoho to start receiving mails to your inbox. Steps 1 and 2 were pretty easy. Since I only have 4 users accounts, it took a few minutes to setup my four users in the Control panel. I skipped Step 3, I don’t really keep a lot of personal email. My current email was stored in Apple Mail and I was fine leaving it there. The interesting step is number 4. The Internet works via DNS. The domain naming system allows everyone and everything to find each other on the network. This is accomplished by DNS having different types of records to point requests to the right place. In the case of most personal domains, you have two different parties involved. The first is a domain registrar who takes care of your domain registration. The second is your hosting provider, usually for shared hosting this is a cPanel type hosting provider. When someone tries to email you at user@some_domain_name.net, a lookup is made to the root DNS authority for the .net domains, your registrar is what adds your domain to the DNS authority servers. The root server then sends you to your nameservers specified. Your nameservers are at your cPanel hosting provider. The final step in the lookup is to see what your cPanel nameserver has for what is called the MX records. The MX records have the server that processes your email and ideally where the email is going to go. 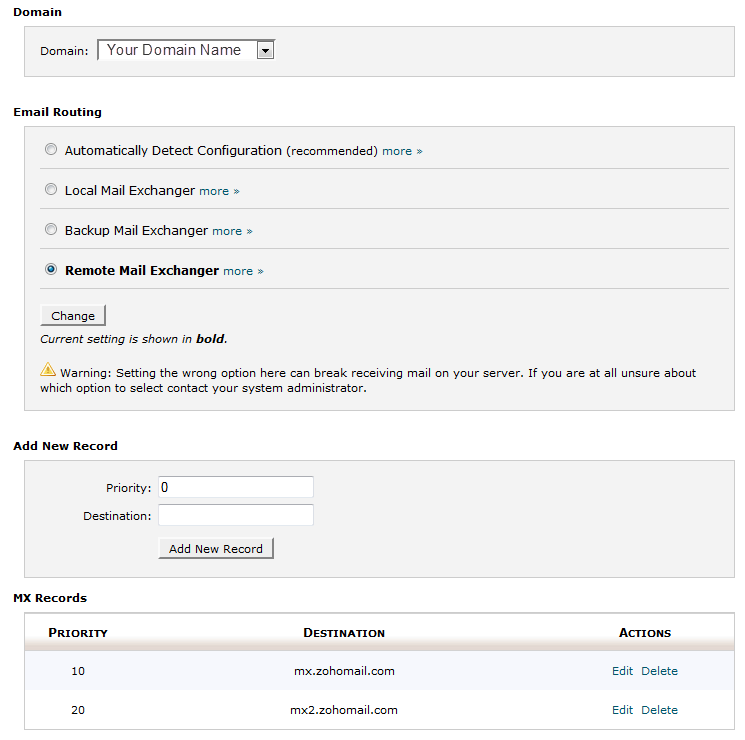 Your current hosting provider has MX records for its own email processing. What needs to be done, is to remove the current MX records and replace them with MX records that point to Zoho’s servers. This way only your email, emails sent to user@some_domain_name.net, will route to Zoho, but everything else will still be at your current hosting provider. To do this most cPanel hosts make it easy to do this now. Log into your cPanel control panel and scroll down to the Email section. You want to click open the MX Entry icon. The DNS changes take a matter of minutes to a couple of hours to propagate to the rest of the internet.